The Consumer Federation of America (CFA) says in a new study that it can explain why auto insurance rates have risen some 43 percent across the country in the past 25 years: loose regulations on how insurers price policies. The insurance industry, however, isn’t on board with that conclusion. While the cost findings aren’t new—Online Auto Insurance News (OAIN) reported on a similar study back in June—CFA’s conclusions in the new study are clear cut. The report lays the increase in auto rates squarely on how insurance is regulated, with a glowing review of California’s regulatory infrastructure and insurance marketplace by the CFA. According to the report, California was the only state to see a decline in the average expenditure on auto insurance between 1989 and 2010. That state passed Proposition 103 in 1988, which limited the factors insurance companies could use to set rates, among other regulations. According to a previous CFA study, California saw a decrease in auto rates of 0.3 percent over a 25-year period. The study released this week gave credit to the reforms implemented by the passage of Proposition 103. “This was the result of strong regulatory oversight and a more competitive market fostered by the 1988 insurance reform measure,” said CFA director of insurance Bob Hunter. 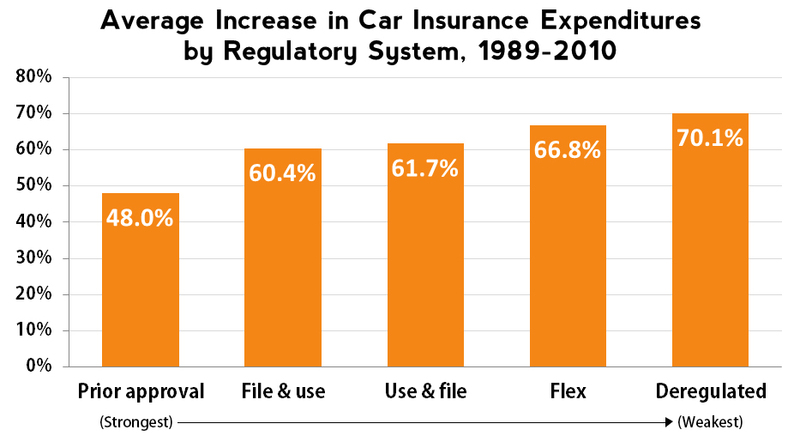 States with less regulatory oversight have the highest increase in auto rates. Deregulated states have the least competitive auto insurance markets. Insurance companies are able to maintain profitability even in states that have greater regulatory oversight. Limiting the costs passed down to policyholders, including “excessive salaries” for insurance employees. Using driving history as the chief factor when setting individual rates. Eliminating other rating factors such as education, occupation and prior insurance coverage. Allow consumers to participate in the rate-setting process. All of those regulations were implemented in California after the passage of Proposition 103. Shortly after the study was released, the insurance industry responded with their own analysis of why prices in California remain lower than the national average. The Insurance Information Institute (III) cited state Supreme Court rulings, safety advances such as air bags, along with other state auto insurance rules as reasons for the stabilization of rates in California. Meanwhile, the III disputed the CFA findings of significant rate increases in the auto insurance market. Studying rates over a 10-year span, the III’s president Robert Hartwig stated that rates have increased only 4.2 percent over that time. The Property Casualty Insurers Association of America (PCI) also criticized the report, citing tort reform, fraud fighting and tough DUI laws as drivers of lower auto insurance rates. CFA’s Hunter, who helped draft California’s Proposition 103, dismissed those arguments to OAIN.